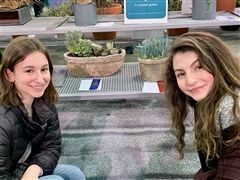 Seniors Sarah Engelman (left) and Eliana Warshal (right) pose next to their award winning succulent gardens. They are just some of the students that competed in this category. Students hand-make their concrete containers and arrange all of the succulents for the Flower Show. “Everybody does it.” Electronic cigarettes, also known as e-cigarettes and vapes, have become ubiquitous among teenagers nationwide. Comprised primarily of nicotine, e-cigarettes have become popular due to their sleek design and colorful flavors. However, many teenagers are unaware of the dangers of vaping, as well as the laws surrounding their use. As the country prepares to cast their votes on Tuesday, November 6, Shipley has taken on the challenge of educating the student body on civic responsibility and encouraging civil discourse among a wide range of viewpoints. According to Pew Research Center, nearly half of registered voters have “expressed being more enthusiastic than usual about flocking to the polls” in this year’s primary elections— “nearly a ten percent jump” from last year. 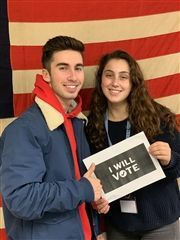 Young people are playing an important role with “voters aged 18-29 comprising 61.4 percent of new registrants” in Pennsylvania alone as reported by TargetSmart’s research team. When the Shipley School first opened its doors in 1894, its founders aspired to create a learning environment that would both challenge young minds to think critically while emphasizing the importance of developing strong moral character. Throughout her childhood, Anita Zhu, a senior, always loved playing with balloons. Once she found out what the sport of volleyball entailed, she was immediately intrigued and switched her love of balloons to volleyballs. She shares, “Both [my] parents met while playing volleyball in college. My mom was on the women’s team while my father was on the men’s team...The university they went to was huge, and they probably would have never found each other if not for the sport.” For that reason, volleyball has a very special connection for Anita to her parents. Each year, students are required to take their grade level general English class. 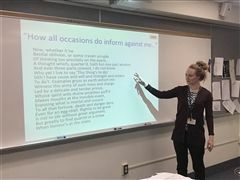 By senior year, students have the option of choosing which English class interests them from many of single semester options. Now, with the end of the first semester, seniors have just finished their first electives courses. For the standard courses, the options ranged from Shakespeare’s most famous plays to African Americans voices. The Beacon is Shipley's print newspaper, with the inaugural issue first published on October 3, 1955. 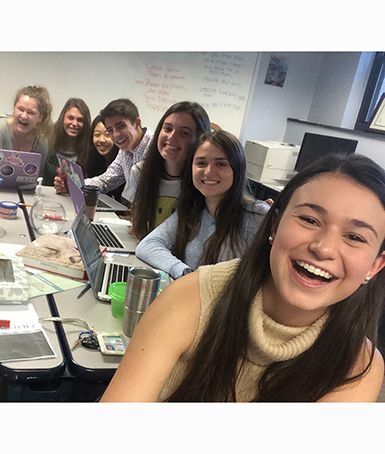 It is produced by Upper School students under the guidance of a faculty advisor, and is comprised of one or more Editor in Chiefs, senior editors, and a contributing staff of 25/30 students. Between six and seven issues are published annually, with topics ranging from student life, politics, topical issues, in-depth reports, entertainment, to sports and featured students. The Beacon is produced in a tabloid format at the professional level using Adobe Photoshop and InDesign. Published since 1955, The Beacon is the official student newspaper at The Shipley School, a PreK-12 private institution with a population of roughly 830 students, and is regularly published throughout year. The school newspaper serves as an educational experience providing a reporting opportunity for students interested in journalism. The role of The Beacon is to inform and entertain and includes topics relevant to students and the greater community. The Beacon endeavors to be accurate and factual in its coverage of local and global issues. Content is determined by the editorial staff and faculty advisor. Print issues of The Beacon (are available to all Upper School students) and additional issues are distributed to each division of the school. 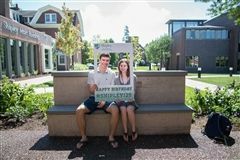 A PDF version is available to members of the Shipley student community, families, and alumni by logging on to the secure website. In 2012, The Beacon published its first online edition, also available to members of the Shipley student community, families, and alumni by logging on to the secure website. The opinions expressed in this paper are those of the individual and do not necessarily reflect the opinion of the staff. The Beacon invites letters to Editor which may be sent to beacon@shipleyschool.org. Letters must be addressed to the editor signed by the author and verified for publication by the editorial board. If published, the meaning of any submission will not be altered, however, we reserve the right to correct grammar, punctuation and spelling. Students, families and colleagues have access to a PDF of each edition of The Beacon. Shipley’s print newspaper, The Beacon, recently received a Gold Medal from the Columbia Scholastic Press Association (CSPA) in the Scholastic Newspaper Print Critique category for the 2016-2017 academic year. The Compass is Shipley's literary and visual arts magazine, published annually since 1941. 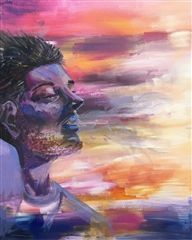 A student editorial board, under the guidance of a faculty advisor, solicits and evaluates student creative writing such as poems, essays and short stories for inclusion in the magazine. Student art work, chosen by the Art Department and the editorial board, also features prominently in the magazine. The Compass is produced in book form at the professional level using InDesign. The Compass welcomes submissions of creative writing from students in grades 9 through 12. The editorial board reviews and evaluates all submissions and chooses those to include in the publication. Individuals are sometimes asked to revise and re-submit their work after meeting with the editorial board. The editorial board strives not to alter the meaning of any submissions that are published, but it reserves the right to correct grammar and mechanics.